The decompiled source code for the popular video game Undertale has been posted to GitHub. This decompilation contains what appears to be all of the game's assets, including its images, scripts, and audio files. Undertale is an RPG created by developer Toby Fox using GameMaker Studio that was released in 2015 and quickly became a cult classic. Approximately, 20 hours ago, a GitHub repository was created by a user named TotallyTobyFox who stated that he was given the source code and was told they could post it. This posted source code contains all of the assets of the game including the GameMaker scripts, audio, and image files. When users originally questioned whether he was the real Toby Fox deciding to share his source code, TotallyTobyFox stated that he was not and that someone sent him the source code to share. 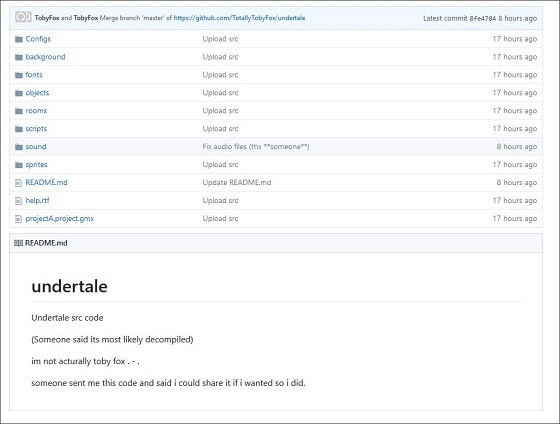 After analyzing the source code, many users feel that this was a handcrafted decompile of Undertale rather than the actual source code being leaked. It is not known who actually decompiled the source code, but according to a comment posted by GovanifY, it is suspected that a user named Silica was involved in the release of this source code. When BleepingComputer asked GovanifY why he suspected Silica, he told us it was because Silica had posted a YouTube video showcasing the source code at almost the same time that GitHub shows TotallyTobyFox posted it on Github. While decompiling a product you own or are allowed to use may be considered legal, publishing the decompiled source code is a copyright infringement against the original developer. I would expect Toby Fox to have the project removed from GitHub once he is aware of it. Unfortunately, once something is posted online, it is almost impossible to completely remove it. BleepingComputer has attempted to contact Undertale developer Toby Fox and Silica, but have not received a response at this time. Silica has told BleepingComputer that they did not decompile Undertale, but received it from someone else. He also stated that it could have been from decompilation that was previously posted on the now defunct Nulled.io forum. Users have already trying to compile Undertale using the released source code, but are receiving compilation errors. Users feel like this could be caused by trying to compile the source code using a different version of GameMaker Studio than what was originally used to create the game.